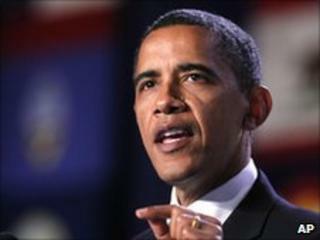 Barack Obama has warned against cutting national debts too quickly as it would put economic recovery at risk. In a letter to G20 leaders, the US president said that while it was important to put in place "credible plans" to cut deficits, withdrawing economic stimulus early was dangerous. "[In the past] stimulus was too quickly withdrawn and resulted in renewed hardships and recession," he warned. But Mr Obama said the US would still aim to halve is own deficit by 2013. The US budget deficit would be cut to 3% of GDP by 2015, the president said. The leaders of the world's 20 leading economies are due to meet in Toronto on 26 June. Mr Obama said the priority of the meeting should be "to safeguard and strengthen the recovery". The BBC World Service's economics correspondent Andrew Walker said the letter appeared to express the US administrations reservations over recent changes in economic policy in Europe. "There has been a marked change in emphasis in the G20 in the last few weeks," he said. "For many of the group's member countries, especially in Europe, the case for stimulating economic recovery using the public finances has been overtaken by concerns about stabilising government debt." The governments of several large European countries, Germany and the United Kingdom among them, have recently outlined plans for spending cuts. In comments apparently directed at China, Mr Obama also stressed the need for flexible exchange rates to ensure a balanced global economy. China has been criticised by the US for failing to allow its currency to trade freely. The G20, which includes both developed and developing economies such as Russia, China and Argentina, has taken the lead in efforts to tackle the global financial crisis.